Dear everyone, wish all of you a very Happy Shri Krishna Janmasthami. May Sri BalGopala always bestows his infinite mercy upon you & fulfills all your wishes. Jai Kanhaiya Lal. Jai Yashodha Lal Ki. Jai NandNandan Ki. Jai Devaki Nandan ki. Jai Vasudev suta ki. The Advent of Lord Krishna Once the world was overburdened by the unnecessary defense force of different kings, who were actually demons, but were posing themselves as the royal order. At that time, the whole world became perturbed, and the predominating deity of this earth, known as Bhumi, went to see Lord Brahma to tell of her calamities due to the demoniac kings. Bhumi assumed the shape of a cow and presented herself before Lord Brahma with tears in her eyes. She was bereaved and was weeping just to invoke the lord's compassion. She related the calamitous position of the earth, and after hearing this, Lord Brahma became much aggrieved, and he at once started for the ocean of milk, where Lord Visnu resides. Lord Brahma was accompanied by all the demigods headed by Lord Siva, and Bhumi also followed. Arriving on the shore of the milk ocean, Lord Brahma began to pacify the Lord Visnu who formerly saved the earthly planet by assuming the transcendental form of a boar. In the Vedic mantras, there is a particular type of prayer called Purusa-sukta. Generally, the demigods offer their obeisances unto Visnu, the Supreme Personality of Godhead, by chanting the Purusa-sukta. It is understood herein that the predominating deity of every planet can see the supreme lord of this universe, Brahma, whenever there is some disturbance in his planet. And Brahma can approach the Supreme Lord Visnu, not by seeing Him directly, but by standing on the shore of the ocean of milk. There is a planet within this universe called Svetadvipa, and on that planet there is an ocean of milk. It is understood from various Vedic literatures that just as there is the ocean of salt water within this planet, there are various kinds of oceans in other planets. Somewhere there is an ocean of milk, somewhere there is an ocean of oil, and somewhere there is an ocean of liquor and many other types of oceans. Purusa-sukta is the standard prayer which the demigods recite to appease the Supreme Personality of Godhead, Ksirodakasayi-Visnu. 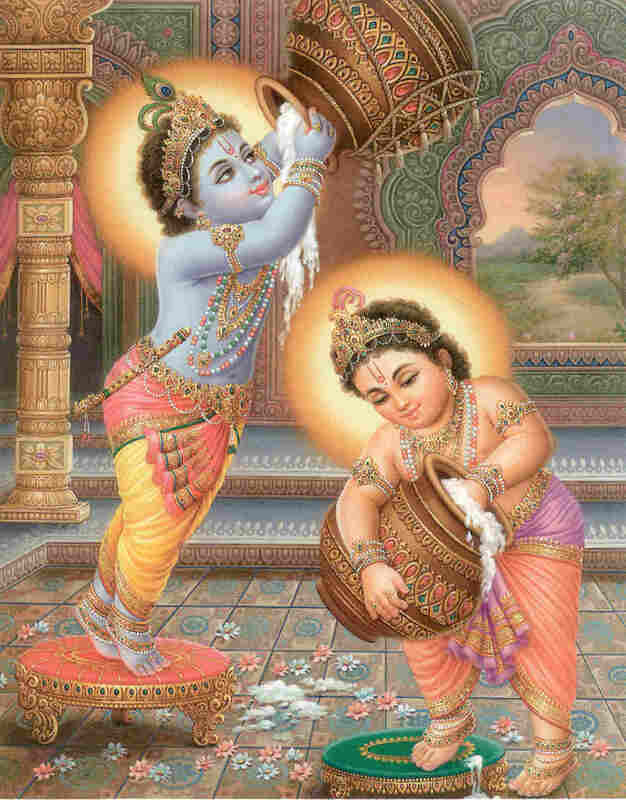 Because He is lying on the ocean of milk, He is called Ksirodakasayi-Visnu. He is the Supreme Personality of Godhead, through whom all the incarnations within this universe appear. After all the demigods offered the Purusa-sukta prayer to the Supreme Personality of Godhead, they apparently heard no response. Then Lord Brahma personally sat in meditation, and there was a message-transmission from Lord Visnu to Brahma. Brahma then broadcast the message to the demigods. That is the system of receiving Vedic knowledge. The Vedic knowledge is received first by Brahma from the Supreme Personality of Godhead, through the medium of the heart. As stated in the beginning of Srimad-Bhagavatam, tene brahma hrda: the transcendental knowledge of the Vedas was transmitted to Lord Brahma through the heart. Here also, in the same way, only Brahma could understand the message transmitted by Lord Visnu, and he broadcast it to the demigods for their immediate action. The message was: The Supreme Personality of Godhead will appear on the earth very soon along with His supreme powerful potencies, and as long as He remains on the earth planet to execute His mission of annihilating the demons and establishing the devotees, the demigods should also remain there to assist Him. They should all immediately take birth in the family of the Yadu dynasty, wherein the Lord will also appear in due course of time. The Supreme Personality of Godhead Himself, Krsna, personally appeared as the son of Vasudeva. Before He appeared, all the demigods, along with their wives, appeared in different pious families in the world just to assist the Lord in executing His mission. The exact word used here is tatpriyartham, which means the demigods should appear on the earth in order to please the Lord. In other words, any living entity who lives only to satisfy the Lord is a demigod. The demigods were further informed that the plenary portion of Lord Krsna, Ananta, who is maintaining the universal planets by extending His millions of hoods, would also appear on earth before Lord Krsna's appearance. They were also informed that the external potency of Visnu (maya), with whom all the conditioned souls are enamored, would also appear just to execute the purpose of the Supreme Lord. After instructing and pacifying all the demigods, as well as Bhumi, with sweet words, Lord Brahma, the father of all prajapatis, or progenitors of universal population, departed for his own abode, the highest material planet, called Brahmaloka. The leader of the Yadu dynasty, King Surasena, was ruling over the country known as Mathura (the district of Mathura), as well as the district known as Surasena. On account of the rule of King Surasena, Mathura became the capital city of all the kings of the Yadus. Mathura was also made the capital of the kings of the Yadu dynasty because the Yadus were a very pious family and knew that Mathura is the place where Lord Sri Krsna lives eternally, just as He also lives in Dvaraka. Once upon a time, Vasudeva, the son of Surasena, just after marrying Devaki, was going home on his chariot with his newly wedded wife. The father of Devaki, known as Devaka, had contributed a sufficient dowry because he was very affectionate toward his daughter. He had contributed hundreds of chariots completely decorated with gold equipment. At that time, Kamsa, the son of Ugrasena, in order to please his sister, Devaki, had voluntarily taken the reins of the horses of Vasudeva's chariot and was driving. According to the custom of the Vedic civilization, when a girl is married, the brother takes the sister and brother-in-law to their home. Because the newly married girl may feel too much separation from her father's family, the brother goes with her until she reaches her father-in-law's house. The full dowry contributed by Devaka was as follows: 400 elephants fully decorated with golden garlands, 15,000 decorated horses, and 1800 chariots. He also arranged for 200 beautiful girls to follow his daughter. The ksatriya system of marriage, still current in India, dictates that when a ksatriya is married, a few dozen of the bride's young girlfriends (in addition to the bride) go to the house of the king. The followers of the queen are called maidservants, but actually they act as friends of the queen. This practice is prevalent from time immemorial, traceable at least to the time before the advent of Lord Krsna 5,000 years ago. So Vasudeva brought home another 200 beautiful girls along with his wife. While the bride and bridegroom were passing along on the chariot, there were different kinds of musical instruments playing to indicate the auspicious moment. There were conchshells, bugles, drums and kettledrums; combined together, they were vibrating a nice concert. The procession was passing very pleasingly, and Kamsa was driving the chariot, when suddenly there was a miraculous sound vibrated from the sky which especially announced to Kamsa: "Kamsa: you are such a fool. You are driving the chariot of your sister and your brother-in-law, but you do not know that the eighth child of this sister will kill you." Kamsa was the son of Ugrasena, of the Bhoja dynasty. It is said that Kamsa was the most demoniac of all the Bhoja dynasty kings. Immediately after hearing the prophecy from the sky, he caught hold of Devaki's hair and was just about to kill her with his sword. Vasudeva was astonished at Kamsa's behavior, and in order to pacify the cruel, shameless brother-in-law, he began to speak as follows, with great reason and evidence. He said, "My dear brother-in-law Kamsa, you are the most famous king of the Bhoja dynasty, and people know that you are the greatest warrior and a valiant king. How is it that you are so infuriated that you are prepared to kill a woman who is your own sister at this auspicious time of her marriage? Why should you be so much afraid of death? Death is already born along with your birth. From the very day you took your birth, you began to die. Suppose you are twenty-five years old; that means you have already died twenty-five years. Every moment, every second, you are dying. Why then should you be so much afraid of death? Final death is inevitable. You may die either today or in a hundred years; you cannot avoid death. Why should you be so much afraid? Actually, death means annihilation of the present body. As soon as the present body stops functioning and mixes with the five elements of material nature, the living entity within the body accepts another body, according to his present action and reaction. It is just as when a man walks on the street; he puts forward his foot, and when he is confident that his foot is situated on sound ground, he lifts the other foot. In this way, one after another, the body changes and the soul transmigrates. See how the plantworms change from one twig to another so carefully! Similarly, the living entity changes his body as soon as the higher authorities decide on his next body. As long as a living entity is conditioned within this material world, he must take material bodies one after another. His next particular body is offered by the laws of nature, according to the actions and reactions of this life. "This body is exactly like one of the bodies which we always see in dreams. During our dream of sleep, we create so many bodies according to mental creation. We have seen gold and we have also seen a mountain, so in a dream we can see a golden mountain by combining the two ideas. Sometimes in dreams, we see that we have a body which is flying in the sky, and at that time we completely forget our present body. Similarly, these bodies are changing. When you have one body, you forget the past body. During a dream, we may make contact with so many new kinds of bodies, but when we are awake we forget them all. And actually these material bodies are the creations of our mental activities. But at the present moment we do not recollect our past bodies. "The nature of the mind is flickering. Sometimes it accepts something, and immediately it rejects the same thing. Accepting and rejecting is the process of the mind in contact with the five objects of sense gratification: form, taste, smell, sound, and touch. In its speculative way, the mind comes in touch with the objects of sense gratification, and when the living entity desires a particular type of body, he gets it. Therefore, the body is an offering by the laws of material nature. The living entity accepts a body and comes out again into the material world to enjoy or suffer according to the construction of the body. Unless we have a particular type of body, we cannot enjoy or suffer according to our mental proclivities inherited from the previous life. The particular type of body is actually offered to us according to our mental condition at the time of death. "The luminous planets like the sun, moon or the stars reflect themselves in different types of reservoirs, like water, oil or ghee. The reflection moves according to the movement of the reservoir. The reflection of the moon is on the water, and the moving water makes the moon also appear to be moving, but actually the moon is not moving. Similarly, by mental concoction, the living entity attains different kinds of bodies, although actually he has no connection with such bodies. But on account of illusion, being enchanted by the influence of maya, the living entity thinks that he belongs to a particular type of body. That is the way of conditioned life. Suppose a living entity is now in a human form of body. He thinks that he belongs to the human community, or a particular country or particular place. He identifies himself in that way and unnecessarily prepares for another body which is not required by him. Such desires and mental concoctions are the cause of different types of body. The covering influence of material nature is so strong that the living entity is satisfied in whatever body he gets, and he identifies with that body with great pleasure. Therefore, I beg to request you not to be overwhelmed by the dictation of your mind and body." Vasudeva thus requested Kamsa not to be envious of his newly married sister. One should not be envious of anyone, because envy is the cause of fear both in this world and in the next when one is before Yamaraja (the lord of punishment after death). Vasudeva appealed to Kamsa on behalf of Devaki, stating that she was his younger sister. He also appealed at an auspicious moment, at the time of marriage. A younger sister or brother is supposed to be protected as one's children. "The position is overall so delicate," Vasudeva reasoned, "that if you kill her, it will go against your high reputation." Vasudeva tried to pacify Kamsa by good instruction as well as by philosophical discrimination, but Kamsa was not to be pacified because his association was demoniac. Because of his demoniac associations, he was always a demon, although born in a very high royal family. A demon never cares for any good instruction. He is just like a determined thief; one can give him moral instruction, but it will not be effective. Similarly, those who are demoniac or atheistic by nature can hardly assimilate any good instruction, however authorized it may be. That is the difference between demigod and demon. Those who can accept good instruction and try to live their lives in that way are called demigods, and those who are unable to take such good instruction are called demons. Failing in his attempt to pacify Kamsa, Vasudeva wondered how he would protect his wife Devaki. When there is imminent danger, an intelligent person should try to avoid the dangerous position as far as possible. But if, in spite of endeavoring by all intelligence, one fails to avoid the dangerous position, there is no fault on his part. One should try his best to execute his duties, but if the attempt fails, he is not at fault. Vasudeva thought of his wife as follows: "For the present let me save the life of Devaki, then later on, if there are children, I shall see how to save them." He further thought, "If in the future I get a child who can kill Kamsa--just as Kamsa is thinking--then both Devaki and the child will be saved because the law of Providence is inconceivable. But now, some way or other, let me save the life of Devaki." There is no certainty how a living entity contacts a certain type of body, just as there is no certainty how the blazing fire comes in contact with a certain type of wood in the forest. When there is a forest fire, it is experienced that the blazing fire sometimes leaps over one tree and catches another by the influence of the wind. Similarly, a living entity may be very careful and fearful in the matter of executing his duties, but it is still very difficult for him to know what type of body he is going to get in the next life. Maharaja Bharata was very faithfully executing the duties of self-realization, but by chance he contacted temporary affection for a deer, and he had to accept his next life in the body of a deer. Vasudeva, after deliberating on how to save his wife, began to speak to Kamsa with great respect, although Kamsa was the most sinful man. Sometimes it happens that a most virtuous person like Vasudeva has to flatter a person like Kamsa, a most vicious person. That is the way of all diplomatic transactions. Although Vasudeva was deeply aggrieved, he presented himself outwardly as cheerful. He addressed the shameless Kamsa in that way because he was so atrocious. Vasudeva said to Kamsa, "My dear brother-in-law, please consider that you have no danger from your sister. You are awaiting some danger because you have heard a prophetic voice in the sky. But the danger is to come from the sons of your sister, who are not present now. And who knows? There may or may not be sons in the future. Considering all this, you are safe for the present. Nor is there cause of fear from your sister. If there are any sons born of her, I promise that I shall present all of them to you for necessary action." Kamsa knew the value of Vasudeva's word of honor, and he was convinced by his argument. For the time being, he desisted from the heinous killing of his sister. Thus Vasudeva was pleased and praised the decision of Kamsa. In this way, he returned to his home. After due course of time, Vasudeva and Devaki gave birth to eight male children, as well as one daughter. When the first son was born, Vasudeva kept his word of honor and immediately brought the child before Kamsa. It is said that Vasudeva was very much elevated and famous for his word of honor, and he wanted to maintain this fame. Although it was very painful for Vasudeva to hand over the newly born child, Kamsa was very glad to receive him. But he became a little compassionate with the behavior of Vasudeva. This event is very exemplary. For a great soul like Vasudeva, there is nothing considered to be painful in the course of discharging one's duty. A learned person like Vasudeva carries out his duties without hesitation. On the other hand, a demon like Kamsa never hesitates in committing any abominable action. It is said, therefore, that a saintly person can tolerate all kinds of miserable conditions of life, a learned man can discharge his duties without awaiting favorable circumstances, a heinous person like Kamsa can act in any sinful way, and a devotee can sacrifice everything to satisfy the Supreme Personality of Godhead. Kamsa became satisfied by the action of Vasudeva. He was surprised to see Vasudeva keeping his promise, and being compassionate upon him and pleased, he began to speak as follows: "My dear Vasudeva, you need not present this child to me. I am not in danger from this child. I have heard that the eighth child born of you and Devaki will kill me. Why should I accept this child unnecessarily? You can take him back." When Vasudeva was returning home with his first-born child, although he was pleased by the behavior of Kamsa, he could not believe in him because he knew that Kamsa was uncontrolled. An atheistic person cannot be firm in his word of honor. One who cannot control the senses cannot be steady in his determination. The great politician, Canakya Pandita, said, "Never put your trust in a diplomat or in a woman." Those who are addicted to unrestricted sense gratification can never be truthful, nor can they be trusted with any faith. At that time the great sage Narada came to Kamsa. He was informed of Kamsa's becoming compassionate to Vasudeva and returning his first-born child. Narada was very anxious to accelerate the descent of Lord Krsna as soon as possible. He therefore informed Kamsa that personalities like Nanda Maharaja and all the cowherd men and girls and the wives of the cowherd men in Vrndavana, and, on the other side, Vasudeva, his father Surasena and all his relatives born in the family of Vrsni of the Yadu dynasty, were preparing for the appearance of the Lord. Narada warned Kamsa to be careful of the friends and well-wishers and all the demigods taking birth in those families. Kamsa and his friends and advisors were all demons. Demons are always afraid of demigods. After being thus informed by Narada about the appearance of the demigods in different families Kamsa at once became alert. He understood that since the demigods had already appeared, Lord Visnu must be coming soon. He at once arrested both his brother-in-law Vasudeva and Devaki and put them behind prison bars. Within the prison, shackled in iron chains, Vasudeva and Devaki gave birth to a male child year after year, and Kamsa, thinking each of the babies to be the incarnation of Visnu, killed them one after another. 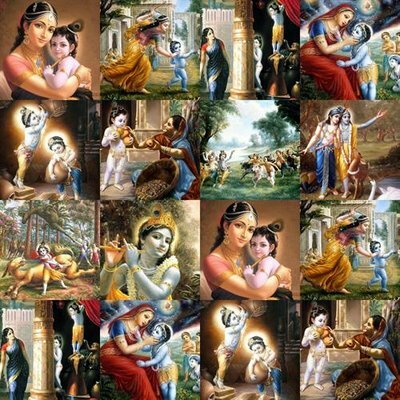 He was particularly afraid of the eighth child, but after the visit of Narada, he came to the conclusion that any child might be Krsna. Therefore it was better to kill all the babies who took birth of Devaki and Vasudeva. This action of Kamsa is not very difficult to understand. There are many instances in the history of the world of persons in the royal order who have killed father, brother, or a whole family and friends for the satisfaction of their ambitions. There is nothing astonishing about this, for the demoniac can kill anyone for their nefarious ambitions. Kamsa was made aware of his previous birth by the grace of Narada. He learned that in his previous birth he was a demon of the name Kalanemi and that he was killed by Visnu. Having taken his birth in the Bhoja family, he decided to become the deadly enemy of the Yadu dynasty; Krsna was going to take birth in that family, and Kamsa was very much afraid that he would be killed by Krsna, just as he was killed in his last birth. He first of all imprisoned his father Ugrasena because he was the chief king among the Yadu, Bhoja, and Andhaka dynasties, and he also occupied the kingdom of Surasena, Vasudeva's father. He declared himself the king of all such places. Thus ends the Bhaktivedanta purport of the First Chapter of Krsna, "Advent of Lord Krsna." King Kamsa not only occupied the kingdoms of the Yadu, Bhoja, and Andhaka dynasties and the kingdom of Surasena, but he also made alliances with all the other demoniac kings, as follows: the demon Pralamba, demon Baka, demon Canura, demon Trnavarta, demon Aghasura, demon Mustika, demon Arista, demon Dvivida, demon Putana, demon Kesi and demon Dhenuka. At that time, Jarasandha was the king of Magadha province (known at present as Bihar state). Thus by his diplomatic policy, Kamsa consolidated the most powerful kingdom of his time, under the protection of Jarasandha. He made further alliances with such kings as Banasura and Bhaumasura, until he was the strongest. Then he began to behave most inimically towards the Yadu dynasty into which Krsna was to take His birth. Being harassed by Kamsa, the kings of the Yadu, Bhoja and Andhaka dynasties began to take shelter in different states such as the state of the Kurus, the state of the Pancalas and the states known as Kekaya, Salva, Vidarbha, Nisadha, Videha and Kosala. Kamsa broke the solidarity of the Yadu kingdom, as well as the Bhoja and Andhaka. He made his position the most solid within the vast tract of land known at that time as Bharatavarsa. When Kamsa killed the six babies of Devaki and Vasudeva one after another, many friends and relatives of Kamsa approached him and requested him to discontinue these heinous activities. But all of them became worshipers of Kamsa. When Devaki became pregnant for the seventh time, a plenary expansion of Krsna known as Ananta appeared within her womb. Devaki was overwhelmed both with jubilation and lamentation. She was joyful, for she could understand that Lord Visnu had taken shelter within her womb, but at the same time she was sorry that as soon as her child would come out, Kamsa would kill Him. At that time, the Supreme Personality of Godhead, Krsna, being compassionate upon the fearful condition of the Yadus, due to atrocities committed by Kamsa, ordered the appearance of His Yogamaya, or His internal potency. Krsna is the Lord of the universe, but He is especially the Lord of the Yadu dynasty. The Yogamaya is the principal potency of the Personality of Godhead. In the Vedas it is stated that the Lord, the Supreme Personality of Godhead, has multipotencies. Parasya saktir vividhaiva sruyate. All the different potencies are acting externally and internally, and Yogamaya is the chief of all potencies. He ordered the appearance of Yogamaya in the land of Vrajabhumi, in Vrndavana, which is always decorated and full with beautiful cows. In Vrndavana, Rohini, one of the wives of Vasudeva, was residing at the house of King Nanda and Queen Yasoda. Not only Rohini, but many others in the Yadu dynasty were scattered all over the country due to their fear of the atrocities of Kamsa. Some of them were even living in the caves of the mountains. The Lord thus informed Yogamaya: "Under the imprisonment of Kamsa are Devaki and Vasudeva, and at the present moment, My plenary expansion, Sesa, is within the womb of Devaki. You can arrange the transfer of Sesa from the womb of Devaki to the womb of Rohini. After this arrangement, I am personally going to appear in the womb of Devaki with My full potencies. Then I shall appear as the son of Devaki and Vasudeva. And you shall appear as the daughter of Nanda and Yasoda in Vrndavana. "Since you will appear as My contemporary sister, people within the world will worship you with all kinds of valuable presentations: incense, candles, flowers and offerings of sacrifice. You shall quickly satisfy their desires for sense gratificiation. People who are after materialistic affection will worship you under the different forms of your expansions, which will be named Durga, Bhadrakali, Vijaya, Vaisnavi, Kumuda, Candika, Krsna, Madhavi, Kanyaka, Maya, Narayani, Isani, Sarada and Ambika."